Get your Redema Ottoman Footrest for only $19.97 here! Please enjoy clicking on the pictures above to get to category pages with more specific information about the Redema, visit our Testimonials page, or just go ahead and Shop. Thank you for stopping by — It’s an honor to have you visit with us! Supporting you from the ground up wherever you go! Take an Elevation Vacation & Get Away with Comfort! Redema Your Soles and More… New Product Offers Health Benefits! Please bookmark this page now, or better yet, subscribe by putting your e-mail address in the box at left, now! You will automatically get the latest info about the Redema, special offers and more! Be sure to tell friends and family about this site (RedemaLiving.com) who would benefit from potential relief from pain or discomfort. 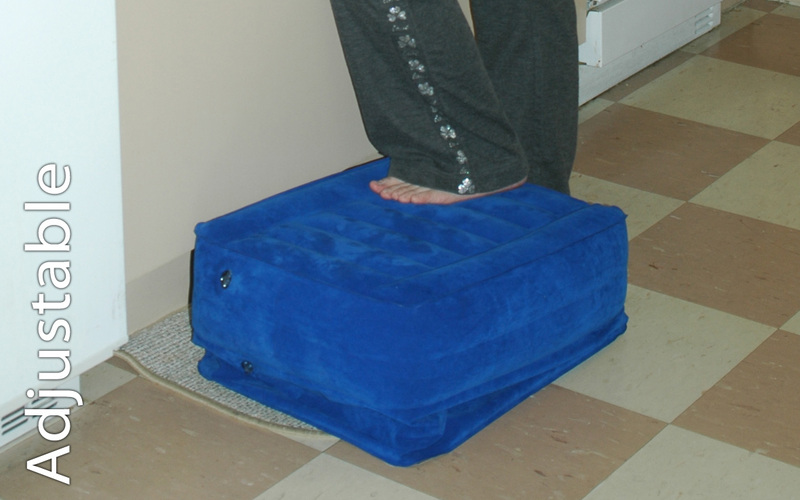 The Redema Ottoman Footrest – Now you can finally enjoy the elevation your body aches for anywhere you like! Keep reading for more information, and visit below to post your comments. Below is a 30 second TV spot I think you’ll enjoy, too. Enjoy your visit, and consider how much more comfortable you could be with a Redema under your feet… Get a quick overview by reading our PR Web Press Release. As seen on Fine Living. Click the triangle below to play! Did you see the latest mini-luxury for lower-body RELIEF? It’s fun to see what it can do in the ad… But, what could it practically do for you? Reduce edema, or swelling? Help you heal? Support your legs while working at your computer? Be travel support? Assist with nursing? My name is Karen Tinsley-Kim, and I’m the product developer of the utility-patented Redema Ottoman Footrest (US#7,464,991). It has not been a simple journey, but certainly a most worthwhile one to provide to you this amazing and yet simple solution to a common physical problem: the ability to easily support or elevate your extremities to relieve pain, swelling or discomfort almost anywhere you go. The need to support my legs and feet has been an issue for me over many years since I suffered with severe leg and foot edema (swelling) during my three pregnancies, and I had repeated injuries to my left ankle which chronically swells now. Even without those issues, I have short legs that often don’t comfortably reach the ground when sitting, and on flights this can be especially tiring. But maybe like you, I simply love getting my feet up! 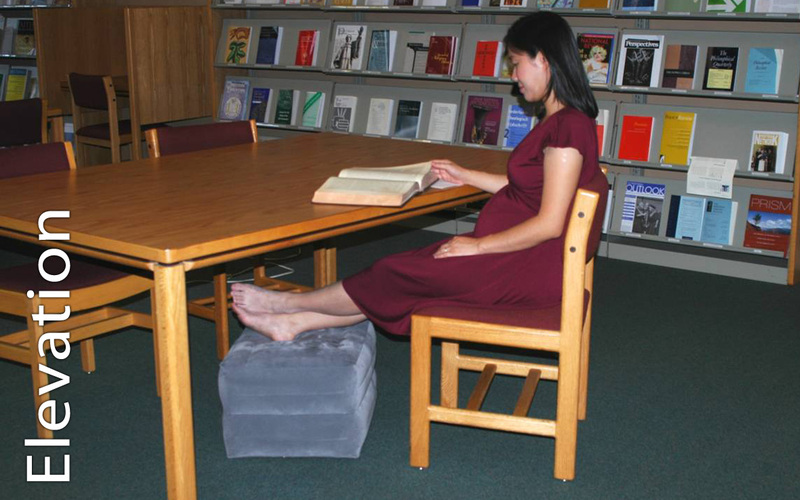 I knew I couldn’t be the only one who would benefit from something that offers easy elevation, so I spent several years between pregnancies searching in catalogs and online for a portable and adjustable footrest… ottoman… or whatever might work. But surprisingly to me, I came up with no suitable results in one product. Enough was enough when I became pregnant with my third and last son. I made a prototype of the Redema, which means to me to “Relieve EDEMA.” (Remember that edema means swelling?) This first Redema was only one-chambered, but it allowed me to elevate my legs most comfortably and yet respectfully in the classroom or office. I could get my feet at or above chair level, which was true bliss when sitting during my last trimester. 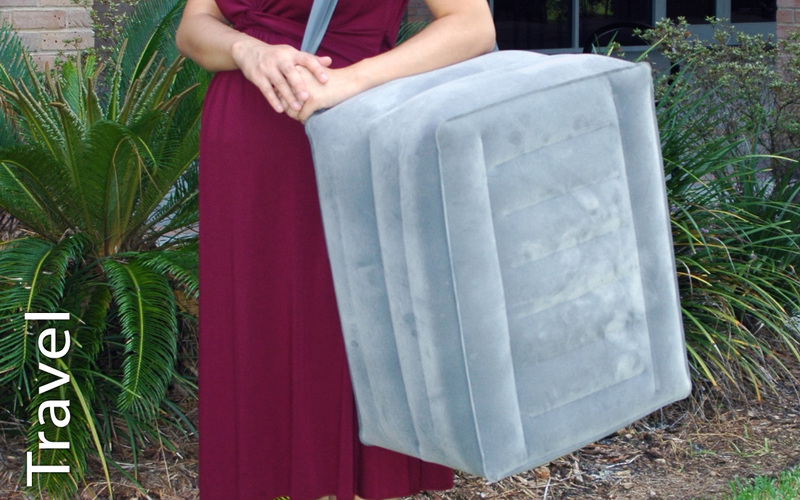 I carried it with the attached strap from office to classroom to car with ease, although I certainly had offers for help — some thought it weighed much more than the less than 2 pounds it was. I comfortably taught up to delivery at 39 years of age, and I credit my Redema prototype with assisting me to get there. 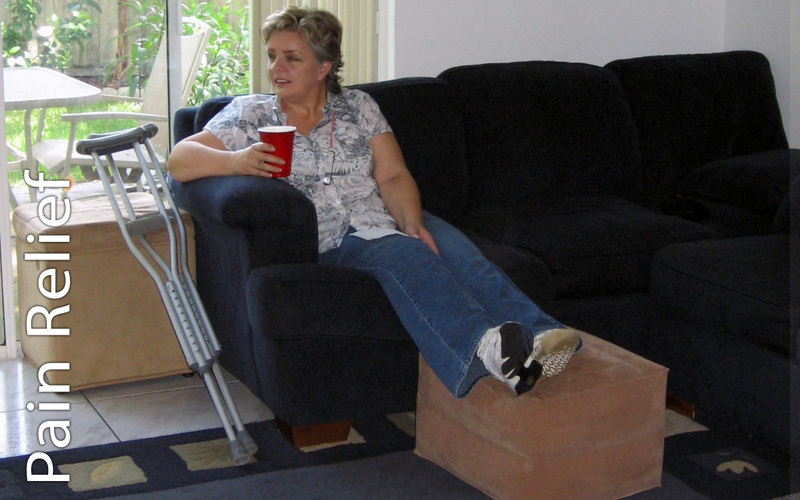 After my first manufactured two-chambered Redema Ottoman Footrests were out, many others were excited because they also found the Redema to be useful for recovering from surgery, circulation issues, were also pregnant or nursing, or suffered with chronic pain. No one having any of those conditions needs to lift anything heavy, but so many of us may need temporary to long-term supportive, adjustable elevation. The Redema has both: adjustable support and very lightweight portability! When you don’t need it, simply deflate it and store it away for future use. I know I love using my Redema even now as I write to you at my desk, as my short legs feel so much better resting on such comfy support — but blessing others with portable relief from pain, discomfort or swelling has definitely been an even greater joy! The response and comments have been overwhelmingly positive, too. Many testimonials are featured in the Redema Testimonials link for your viewing. It also astounds me that the Redema Ottoman Footrest has gained world-wide appeal only in the first year of its introduction — it is on every major continent, including Africa and Australia! Perhaps this is because the Redema is also useful for traveling, especially by air. Don’t miss our latest TV spot above, which makes for a rather fun 30 seconds, and then please visit around my website to learn even more about this simple but amazing product, the Redema Ottoman Footrest. Please contact me at407-365-2332 during regular business hours EST (please leave a message if I don’t answer, I will get back to you by the end of the day) or at admin@redema.us for additional information or questions. Thank you taking the time to read my story. It will be my pleasure to communicate with you to hear about your Redema story or questions. Under your desk, in your RV, on the plane, outside, in the mall, at the movie theater, in worship services, waiting in line, during layovers, for visiting relatives, pregnant or nursing moms, support for tired or short legs, circulation issues, relief from pain… and the list keeps growing! You are warmly invited to relax and visit around the website for more information. We’d love to hear from you! Click Here Now to Get the Rest You Deserve! Why wait to get home to put your feet up? Now you don’t have to. 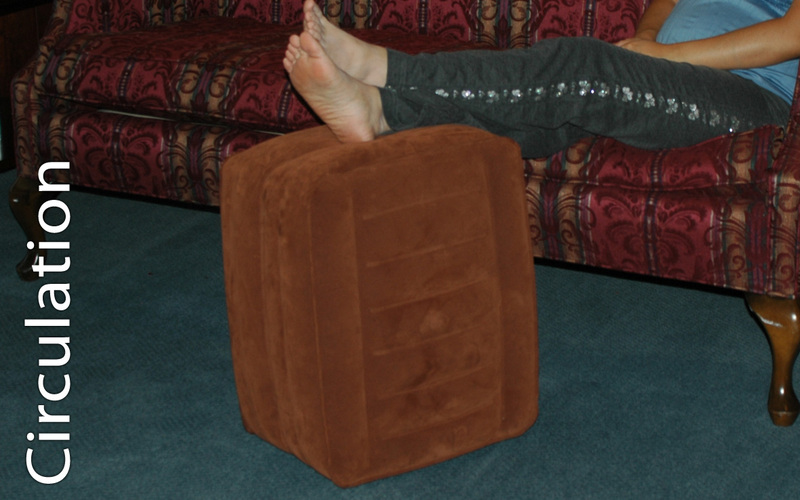 A personal Redema Ottoman Footrest can be your answer for comfort. It’s the only adjustable, almost weightless ottoman footrest anyone can take almost anywhere. Its luxurious velor exterior will soothe you. It weighs under 2 pounds — few footrests can make this claim! The two-chambered design will provide almost any level of support from a few inches up to approximately 20 inches. Make it firm, make it soft. Inflate and turn to your desired comfort level. Rediscover your comfort zone! It has an attached adjustable strap to allow portability just about anywhere. The tote pocket provides a place to tuck away the strap when it is not in use, or use the pocket to tote along a favorite magazine. It was designed by a working pregnant mom who sought portable and comfortable relief from her edema, or swelling of the feet and legs. Although the dimensions were appropriate, an office box just wasn’t cutting it for comfort. After a fruitless search, she designed her own Redema Ottoman Footrest to her desired specifications. It needed to be lightweight and portable, but supportive; a classic design, but comfortable. Most of all, it needed to be adjustable to provide height at different levels. Letting feet and legs rest in one position too long isn’t good for circulation. So when it is fully inflated, you can actually turn it with your feet to a different height to get it “just right” any time, as many times as you like! 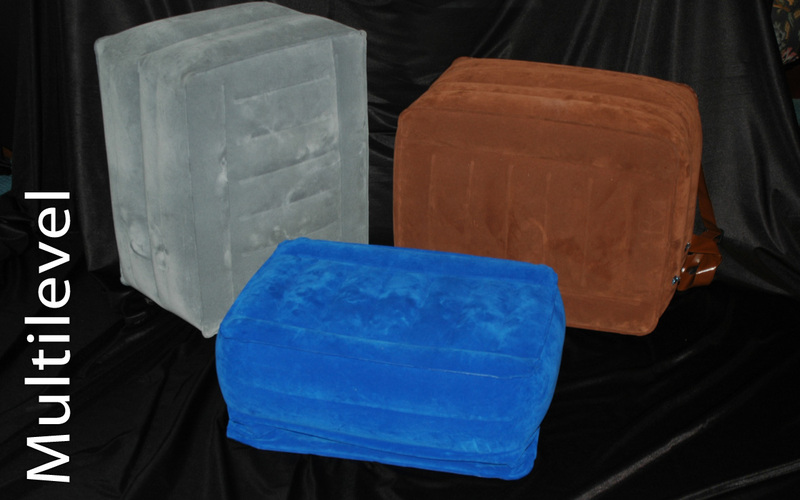 If desired, simply inflate only the top chamber to get some lower support for your feet. The bottom chamber can be partially inflated to provide a desired angle of support or even rock back and forth with you while you enjoy your glider or rocking chair. Then deflate your Redema, partially to carry along as a bag, or even entirely to toss it in your luggage to your next destination! I love this — got one as a gift, and it was just what I needed. Saved me at work, and at home. Thanks so much Karen! Karen, I have to be honest, I was initially just looking for something to prop my feet up, only to randomly find this site and the ottoman I’ve been looking for! I am sure your product will rise to the skies! Once my co-workers see me using one, they’ll want one too! Thanks so much! Thank you so much for your comments, Will! Please spread the word to your co-workers and others to get theirs asap as I don’t know how much longer I’ll have Redema Ottoman Footrests available. Looks wonderful. How do you inflate it? However you may choose to inflate it, you may find it to be almost impossible to do if you do not press the valve so the round opening is oval-shaped. Using your thumb and forefinger to press it open will open the internal valve allowing air to get in. To deflate it, you need to also press/squish/squeeze the valve to let the air out. I like this very much! I skinned my knees a few days ago. I was looking for something that can prop my legs up so that I could feel better. I tried chairs, but not very comfortable. Then I got this redema from Karen. The height and the elasticity of it is just right for me. I put it under my desk. It makes my legs feel very comfortable! Thank you so much, Karen. I am looking for a solution to the severe edema I’m experiencing in my feet/ankles by the end of my workday as a receptionist. I have extremely high blood pressure, despite using Hyzaar and Amlodopine to help lower it (It’s still running 160/100). Can this product assist me in reducing the swelling even if I’m seated in an upright position? I read on another edema website that unless you are reclined, you will not see the benefits with a footstool. There’s a lot of differing opinions and information and I’m just trying to sort through it to find a solution that works best for me. While I can’t guarantee that the Redema Ottoman Footrest will be the only answer that might help your edema, I personally continue to benefit from its use. The primary driver for me in designing the Redema was to be able to get my feet and ankles elevated above chair level, even while sitting at my desk. Being that desks and chairs can be different heights, this goal may be more easily reached in some places over others. Yet, the Redema has two chambers, and it is rectangular, so hopefully you can find an elevation level that provides you some relief from your edema. That being said, please don’t sit for too long. Many articles are out there about the dangers of sitting too long. (So, I’m standing while I type this, resting one foot on my half inflated Redema. 😉 ) I find moving every few minutes, even moving my Redema with my feet, also helps. I hope you will try a Redema Ottoman Footrest to see how it might help give you some relief from your edema and provide some comfort.